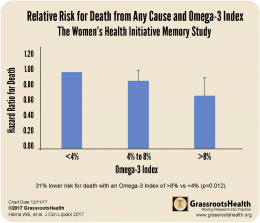 A long-term health study called the Women’s Health Initiative Memory Study included blood samples used to determine Omega-3 Index from 6,501 women, 65-80 years old. Harris et al. studied the baseline Omega-3 Index measurements and the outcome of survival after a median of 14.9 years of follow-up. They found a 31% lower risk of death during the study period if Omega-3 Index was above 8%, as compared to below 4%. Why compare >8% and <4%? Scientists recommend an Omega-3 Index above 8% for best health. The US has an average Omega-3 Index of around 4%. 8% is the goal, and 4% is the norm. The only way to know what your Omega-3 Index is, is to test. After you know where you stand, you can then use this calculator to determine an estimate of how much extra omega-3 supplementation you need to achieve your target Omega-3 Index (recommended within the range of 8-12%). What is the Women’s Health Initiative Memory Study? It was a randomized controlled trial to test whether hormone therapy over many years had an effect on dementia or Alzheimer’s. The study divided the women into active therapy and control groups and monitored the outcome over many years. 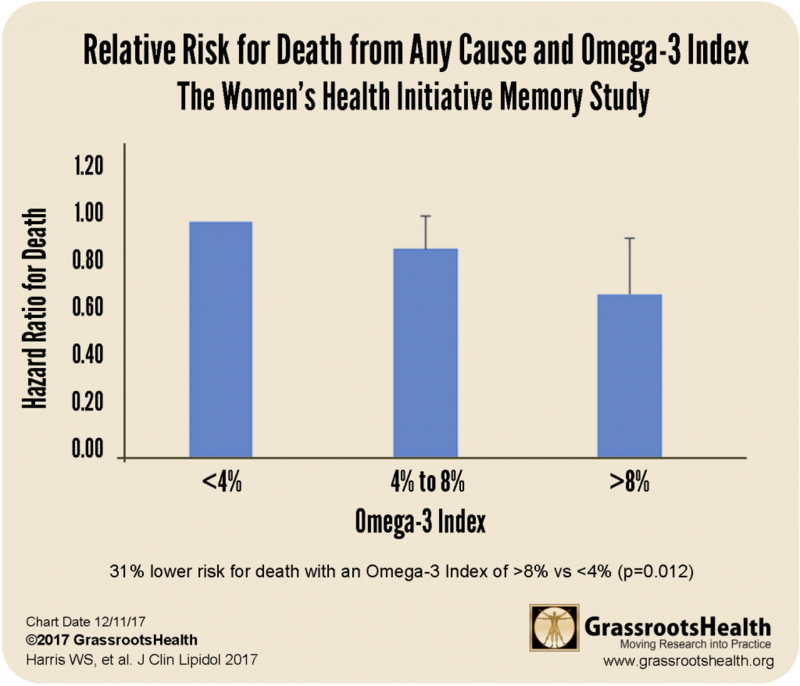 Beyond the primary outcome of dementia, the samples collected from the large study cohort and length of follow up allowed for additional analyses, such as this one on the association of Omega-3 Index and total mortality, to be done.